This palatial apartment is filled with stunning frescoes of museum quality. The vast living room features a ceiling fresco by the Zuccari brothers and has massive windows overlooking the Piazza Mattei and its iconic Turtle Fountain.As well as the 5 bedrooms and 6 bathrooms there is a grand billiards room and private sauna and the main floor has recently been renovated and fitted with state-of-the-art comforts and technology including complimentary WiFi and SKY TV in various languages. Complimentary airport and train station transfers are included.The Ortigia line of shampoo, conditioner, bath wash and body cream is inspired by the flowers and culture of Sicily, created by the master Perfumeur Lorenzo Villoresi. 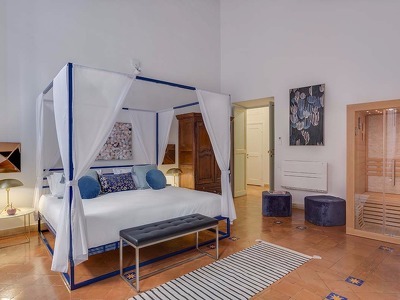 The main floor of Palazzo Costaguti has recently been completely refurbished to the highest standards retaining the original features but integrating state-of-the- art comforts. This luxury apartment can accommodate up to 14 guests across 5 bedrooms and 6 bathrooms on the main and mezzanine floors. The apartment has air conditioning in all of the rooms, complimentary WiFi internet access and SKY TV in multiple languages. There is a twin bedroom, suite bedroom, double bedroom, triple room with king-size bed and single, and a double room with king-size bed and a private sauna for two. This 16th-century frescoed palace apartment sleeps up to 14 in the heart of the old Jewish Quarter in Rome. The Costaguti Experience is one of luxury with some of the best Roman hospitality to be found in the Eternal City. A dedicated concierge is available for check in and check out 24 hours a day by phone, luxury airport and station transfers and a complimentary table with WiFi are just a few of the luxuries included in your stay in these stately rooms. The Costaguti Experience showcases museum-grade frescoes by several masters of the time including the esteemed Cavalier d’Arpino, a painter that commanded Rome’s attention during the Baroque period who was one of the early teachers of Caravaggio, Gaspard Poussin, and the brothers Taddeo and Federico Zuccari. During your stay at Palazzo Costaguti, you have the use of a tablet device, pre-loaded with all the necessary applications allowing you to enjoy Rome to its fullest. Under a ceiling fresco by Cavalier d’Arpino, you can play a game of billiards and relax in a relaxed seating area in the private billiards room. The kitchen is fully-equipped for you to be your own chef or you can take advantage of the private Chef@Home service. To confirm a reservation with The Costaguti Experience it is necessary to pay a 30% deposit by. The non-refundable 70% balance plus refundable € 1.000 security deposit is required 31 days before arrival by bank transfer or pre-authorization. A list of goods and values/damages will be provided in the apartment and referenced in the necessary circumstances.Reservations made within 31 days of arrival require full payment to confirm the booking. This palatial apartment is filled with stunning frescoes of museum quality. The vast living room features a ceiling fresco by the Zuccari brothers and has massive windows overlooking the Piazza Mattei and its iconic Turtle Fountain. As well as the 5 bedrooms and 6 bathrooms there is a grand billiards room and private sauna and the main floor has recently been renovated and fitted with state-of-the-art comforts and technology including complimentary WiFi and SKY TV in various languages. Complimentary airport and train station transfers are included. The Ortigia line of shampoo, conditioner, bath wash and body cream is inspired by the flowers and culture of Sicily, created by the master Perfumeur Lorenzo Villoresi.